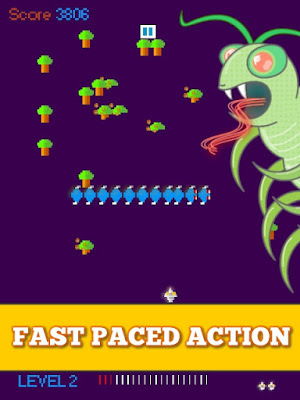 Indie Retro News: Centiplode - Classic Arcade inspired game has crawled its way onto your mobile! Centiplode - Classic Arcade inspired game has crawled its way onto your mobile! Surprisingly I don't play many games on my mobile, mainly for the fact many of them are rather rubbish, but today Gazzapper Games contacted us to let us know their Centipede inspired game has come to your Android and it's well worth playing. You see Centipede was released as a vertical fixed shooter by Atari in 1980 and also featured in the more recent Pixel movie, the game had you defending your garden against not just spiders and scorpions but also a rather nasty splitting Centipede! This game in the Arcades was a real blast to play causing many a lost quarter or two, but when it comes to the latest game on the Android, it looks as if that addiction has been kept, especially with a number of positive feedbacks such as " Really great adaptation to mobile for a much loved oldie " and " Overall best centipede like game ". But if that wasn't enough to get your attention, the game has a screen shaking effect ( optional ), retro color pixel art and chip sounds, 1 or 2 finger control, bonus lives based scoring, as well as additional updates such as bonus levels, more angry baddies, more action and more explosions!